Ravello, one of the most beguiling towns on Italy’s Amalfi Coast, is home to some lovely white wines and light reds made in the Costa d´Amalfi DOC appellation. But for serious wine lovers and especially for those who like intense red wines, you need to go a little further afield, deeper into Campania. You will visit two contrasting high-end properties, enjoy a tasting menu lunch at one of the estate’s refined restaurant and visit the small medieval hamlet of Taurasi. Learn all about Campania’s native grape varietals like the white Falanghina (actually a varietal that the Ancient Greeks imported) and the red Aglianico, making superb wines that have been called “Barolos of the south”. And take in some sightseeing, stopping in medieval Taurasi. We have prepared this one-day wine touring itinerary from Ravello for those looking for a luxurious excursion to the best wine estates in the region. 9 a.m. Your elegant chauffeur and luxury Mercedes will arrive at your hotel in Ravello and you will be swept away to the wine country of Campania. You will head northeast from the Amalfi Coast into Avellino province. 10:45 a.m. Arrive at the first fine wine estate of the day such as Antonio Caggiano, one of the loveliest wineries in Southern Italy. On a private tour, enjoy a walk in the lush vineyards, tour the atmospheric dim barrel cellars and the small wine museum. Finally, conclude your tour with a tasting of Caggiano’s finest wines including the mythical Taurasi Cru Vigna Macchia dei Goti and the luscious white Fiagrè. 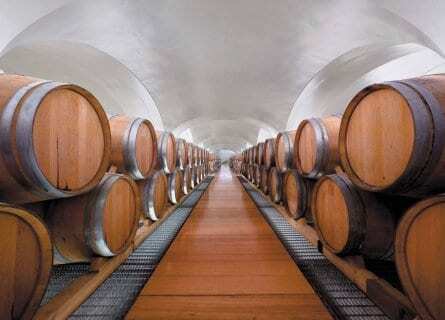 After this winery visit, check out Taurasi and its castle. Have some free time to take photos or pop into a wine shop. 1 p.m. Then on to the next wine estate of the day to the sleek Feudi di San Gregorio winery, for example in Sorbo Serpico (about a half hour drive south). Enjoy a tasting menu lunch in their exclusive Marennà restaurant, where the dishes might include pasta with guinea fowl perfumed with sage and paired with their Campanaro wine, lamb paired with Serpico and almond crunch with cherries marinated in Aglianico wine paired with the dessert wine Privilegio. Sublime cooking and elegant ambiance. The consulting chef here is 3 Michelin starred La Pergola (in Rome), Heinz Beck. After lunch, you will enjoy a tour of the barrel cellars and learn more about the wines, native grape varietals and trends in Campania winemaking in recent years. 4-5:15 p.m. Your driver will take you back to Ravello and drop you off at your hotel. This concludes your one-day wine luxury wine tour of Campania. We hope you had a fantastic day out!